Ajendico Pty Ltd is Australia’s largest supplier of Advanced Business Manager software for small to medium businesses. It is inevitable that when starting a small business, you need to have software that helps you to invoice customers, track stock and debtors and pay employees. Almost any software package in the marketplace today will do the job nicely. However, as your business grows and you target the right marketplace for you and success comes your way with new customers and new products, the software that you initially chose to perform those simple tasks starts to cost you time and money. Making the decision to find software that suits your current and future requirements is the first step. Deciding to buy is much easier when you’ve found the right solution, it can be customized to make you a stand out in your industry and you are partnering with a company that has the skill and the desire to work with you to ensure those goals are achieved. This is where Ajendico Pty Ltd and Advanced Business Manager can help. Since 1995, our team of qualified Advanced Business Manager software professionals have been doing exactly that, working with business owners to ensure that they continue to grow, year after year, and remain the market leader in their industry. Advanced Business Manager was designed and developed by accountants. Believe it or not, there are many software systems in the marketplace today that are not fully integrated. It is common knowledge that anywhere you have a join between two systems, that join needs to be managed. If not, you may not have a join, you may have a hole that can potentially cost your time and dollars to fix. When deciding to buy software for your business, it is important to choose an integrated solution. Our general ledger allows you to run financials by group, division, location, department, cost centre or any other drill down criteria you can name. We manage multi currency and multi company transactions with appropriate cashflow forecasting and budgeting options standard in the system. For larger sites, we can also provide full integrated multi company consolidated reporting, fixed assets and payroll modules. In summary, ABM links business functions together. Advanced Business Manager is designed to grow with your business. Using open architecture and built around Microsoft SQL Server ® with Microsoft Office ® integration, the system is easy to customize to suit the growing needs of any business and can scale from a single user to 100+ workstations. ABM is distributed via exclusive business partners in Australia, Ireland, New Zealand, United Kingdom and Singapore. Advanced Business Manager is in the Cloud. The ABM Cloud can provide a secure hosted solution giving you access to your data from any internet connected device and from anywhere in the world. Our ABM Cloud clients have reduced IT costs, 24/7 availability, daily backups, guaranteed data security and expert support. Can’t find what you are looking for here? Ajendico Pty Ltd can custom write a program for you, tailored to your specific needs. Please contact us directly via email or phone us on (02) 9570 1966 to discuss your requirements in more detail. Our system provides flexible reports that can be previewed on a screen prior to printing or emailed in many different formats. The reports automatically include selection by custom fields setup in your databases. The reports scheduler allows reports to run without human intervention. For those that prefer to work in excel, Alchemex Reports run management packs and dashboard direct to excel, even if you do not have access to the accounting system. Customer transactions from initial inquiry via Customer Relationship Management (CRM) through the transaction cycle, quote, orders, deliveries, invoices, credits and receipts can be managed via ABM. Sales agents can server customers in store visits using Opmetrix. Customer features include the ability to manager deposits, rebates, special prices, special discounts, group discounts, pack size and promotional pricing. ABM’s Fulfillment wizard helps to automate dispatch or orders and our in house Point of Sale options assist with online and offline customer transactions. On the Supplier ledger, ABM allows you to create Purchase Requisitions for approval prior to converting to purchase orders. Transactions include deliveries, invoices, credits, payments, batch bank file payments, reorder wizards, supplier special prices and discounts, supplier rebates and freight allocation on shipments. ABM handles multiple warehouse locations,serial and lot numbers, expiry and use by dates and supports 4 pack sizes, 5 barcodes and 8 price levels for each product. Products can be bought and sold in each, kilo, metre, litre, per 1000, square metre or any combination you can think of. ABM products module has kits and components as a standard feature and a full Manufacturing system for those customers needing more than kit components. Structured stock or matrix of sizes and colours is ideal for workwear, clothing and fashion product wholesalers. All of these stock features work well with our Import Costing module. If the majority of your stock has barcodes, you take advantage of Aspluris, Pick and Pack and Unpack and Stack as well as stocktake and general warehousing functions using PDE scanning devices. 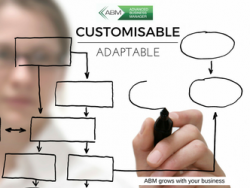 All are fully integrated with the ABM products module and general account system. Job accounting facilities are provided for service industries, construction, engineering, surveying, projects or job manufacturing organizations to sustain a controlled environment for effective management. Jobs may be analyzed by cost centre and split into stages for the purpose of Project Invoicing claims and can be assigned to a job manager for organization and responsibility. Costs and charges are automatically calculated, posted and compared to estimates which reduces time consuming tasks for the user. ABM manages Timesheets for office and onsite staff and retentions for both customer invoices and supplier Sub Contractor claims. ABM includes a number of modifiable security features. Your staff can be assigned to user groups and each group can be allocated access rights to specific operations. Every user gets a unique login to the system and security groups can be setup for one person or many people. This allows ABM to provide a full audit of transactions logged and specific users can be given access to specific company databases. Automation has been a key strategy in use in the design of all functions in ABM. When entering transactions, the General Ledger is automatically posted and automatic alerts are triggered on customers and jobs to make management of these accounts easier. You can automate purchase transactions using the reorder wizard or setting up Back to back ordering for drop ship type transactions. Then you can use the Billfeeds module to automate the data entry of regular transactions such as supplier invoices. On the banking system, automatic bank reconciliation import and data matching plus creation of ABA files for supplier and payroll payments reduce time and errors. Recurring journals and payments and Direct debit processing are standard features in ABM. Excel style import and export functions are located regularly throughout the program. Our report scheduler ensures your reports are produced without human intervention and we provide a mailing list program to send individual emailed information automatically to customers or suppliers.